Bricbrac is a layered family that allows different combinations. The typeface is full-cap, with a squared style, the font doesn't contains any curve. The different styles gives 3D effect to the letters and the typeface user can play with the Lines and Pattern effect. 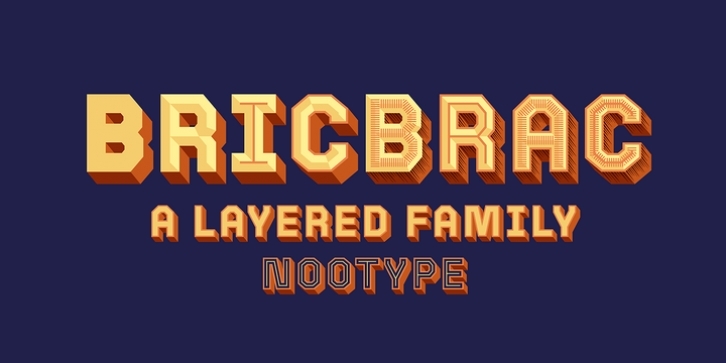 Bricabrac consists in a 9 styles family. This is a monoline typeface and the variety of combinations and style make it perfect for magazine and poster design. The fonts have an extended characters set to support Central, Eastern and Western European languages. Notice: The spacing is optimized for the version with volume, therefore the fonts should always be used with the 3d volume effect.